Geothermal activity along the road near Myvatn in northern Iceland. No, it's not a portfolio image. Because I post, on average, five days a week it's not possible to limit myself to just posting my very best or favorite images. Who would I be kidding? While l do have a pretty high rate of keepers my expectations are high. As a result I'd be lucky to make, on average, 30 images a year with which I'm really happy. In that regard I'm probably just like everyone else. By having less 5 star images it's easier to locate your absolute very best images. By separating your 4 and 5 star images from the rest of your work you'll be able to surround yourself with what you do best. As a result, I believe, you'll do more of the same, more often. By regularly deleting images you'll be setting an ever higher standard for yourself and, as a result, your photography will continue to improve, probably at a faster rate than it would if you were less critical about the quality/success of your current work. So, while not a portfolio image, I feel the above photo still has value. Using the 1-5 star rating system within Lightroom I initially rated this photo as a 3 star, the rating I assign to images I consider deserving of more than basic processing. After the image is processed I'm able to better decide whether to change its rating, up or down, or leave it as a 3 star. Pipes travel across the landscape at a Geothermal Power Plant at sunset near Myvatn in northern Iceland. For example a 4 star image, such as the one of the pipes running through the landscape, is one with which I'm happy. A 4 star rating signifies that the image is, to my way of thinking, one of the best from a particular photography outing. But that's not to say that I end up with a 4 star image after every days photography. I have bad days like everyone else. I want to stress the importance of the photo at the top of this post. It's my least favorite, but making that image made it possible to make all the other photos in this post. The lesson then is not to expect perfection from every photo you make. Just follow your intuition and do the best you can. I was tired when I made the photo at the top of this post and ready to find a place to park the car and sleep. But it was Iceland in summer and, at that time of year, sunrise follows only a few hours after sunset. On a good night the afterglow following sunset can run almost right up to the time of the pre glow prior to sunrise. It was a beautiful night so there was no way I would let fatigue prevent me from exploring this incredible landscape. The action of getting out of the car and spending a few minutes making the first image in this series inspired me to try harder and to continue down the road, just that little bit further. A sunset view of the Krafla Geothermal Power Station near Myvatn in northern Iceland. The reason I have so few 5 star images is that, to be worthy of a 5 star rating, I have to consider it to be amongst my very best work (and I've been photographing for over 35 years), rather than being one of the best images from a particular day's photography. To earn a 5 star rating I'd have to be so happy with the image that I'd consider it worthy of printing and display on my wall. And I have limited wall space. Usually folks only get to see the images I'd rate as 4 or 5 stars. I have hundreds of 4 star images and thousands of 3 star images, a reasonable amount of which will be upgraded to a 4 star rating after post processing has been completed. Despite being upgrading, once post processing had been completed, to a 4 star rating it's not one of my best 4 star images and, except for this post, may never be published in any other format. It's a bit like scoring it as 6 out of 10. That's just not good enough for someone like me, with very high standards. It demonstrates that, when things are against you, attention to composition can help you produce a reasonable result. This approach will allow you, more often than not, to make something out of nothing. As you soon discover the photo proves that effort is often rewarded, but not always when and where we expect or would like it to be. The photo was made in Iceland. The steam stacks in the background drew my attention, as did the little creek in the foreground which was also emitting steam. 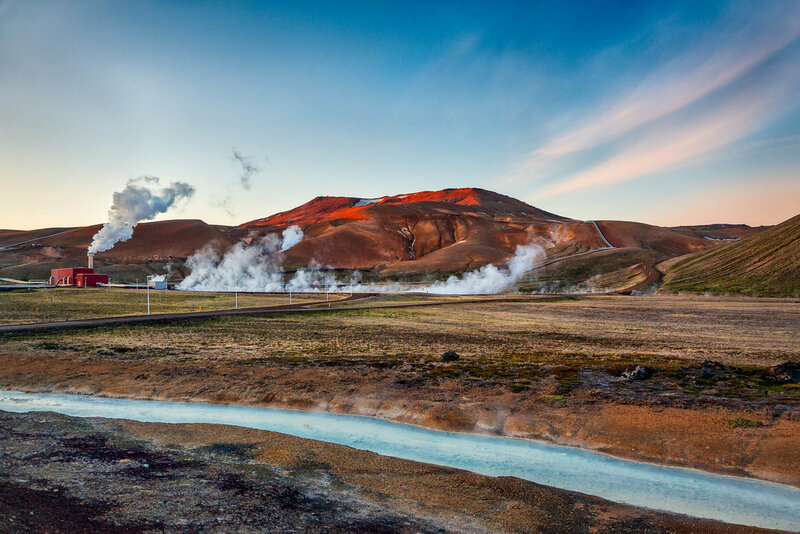 Iceland is, after all, one of the world's best locations for geothermal power. The trouble was there was a fair distance, and not much of interest, between the stream in the foreground and the background steam stacks. The sky was also quite bland. I remember pulling the rented camper van over by the side of the road for a look. I was tired and really needed to sleep. It was clear that I wouldn't be able to make a portfolio image at this location. But steam, whether coming off a creek or venting out of a smoke stack is interesting and those distant hills sure looked promising. It was worth a photo, even just as a way to help me remember this weird landscape. Hey, travel photographers are tourists too. Now I could go crazy and pull out all manner of photoshop tricks to make the image at the top of this post more appealing. But what's the point. A kilometer or two down the road I spent a good 30 minutes making some much more interesting images, including the other two photos of the geothermal plant in this post. I feel each of those images is worthy of a 4 star rating. A spectacular drive, along a sealed road, at the top of a mountain pass near Myvatn in northern Iceland. Now here's the thing. After actually going to the trouble of stopping the car and getting out to make the photo of the power station my body was rejuvenated by the fresh air and movement and my mind was energized and keen to look for nearby photo opportunities. I didn't have to drive far before I reached the top of a pass and looked back down onto this extraordinary landscape. Several hours of exhilarating photography followed, including a hike through a Mordor like terrain where I made the final image in this post at sunrise. What's more some of the photos made that evening were amongst the best from my 6-week photo expedition that included Iceland, Greenland, Paris, Vienna, Salzburg, Moscow, St. Petersburg and Bruges. Well, I hope this post explains the value in that approach. It's by pushing that little bit harder and by continuing your efforts, that little bit longer, that great images are produced. At the end of the day we make our own luck. Now if that's not reason enough to stop the car, get out and take a look around you I don't know what else is.